Home » fmyou's booth » Pee Wee Hunt Dance Party jazz Capitol LP cheesecake Oh! 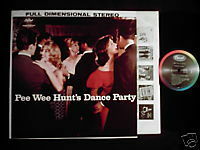 Pee Wee Hunt Dance Party jazz Capitol LP cheesecake Oh! Capitol ST1362 12" Stereo vinyl LP (1960) Pee Wee Hunt Pee Wee's Dance Party 'Way Down Yonder in New Orleans/Swingin' Down the Lane/Five Foot Two/Sentimental Journey/Alexander's Ragtime Band/Sweet Georgia Brown//Oh!/Carolina in the Morning/Moonglow/Bill Bailey/It Had to Be You/Love is Just Around the Corner Excellent condition; cover has some pen marks by track listings.